Are you looking for a new tenant or trying to sell a house? Interested in finding more private lenders? Do you need a referral to a good contractor? A great way to do all of this is with the power of Facebook, Twitter and LinkedIn. The key is to be able to maximize your message to your connections. 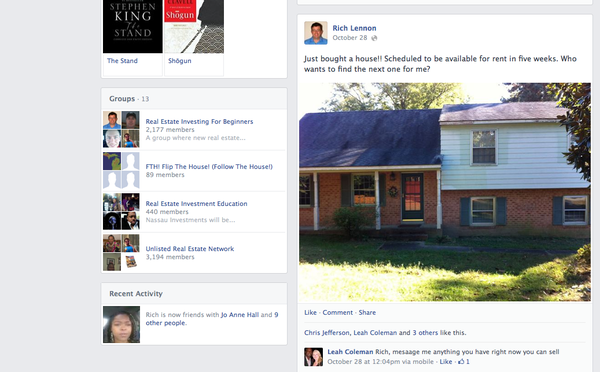 Use Facebook to broadcast your message that you are looking to buy or flip a house. Use a status like this one below to let your connections know you want to buy a house. You can also offer to pay a referral fee and find connections who can learn to “bird dog” houses for you on a regular basis. You can also work to build your buyers list in social media by telling everyone about your great deals. Give your connections a link to your website and ask them to join your VIP Buyers list. See the Twitter example below. Use social media to start discussions on investing, finance, and private lending opportunities. 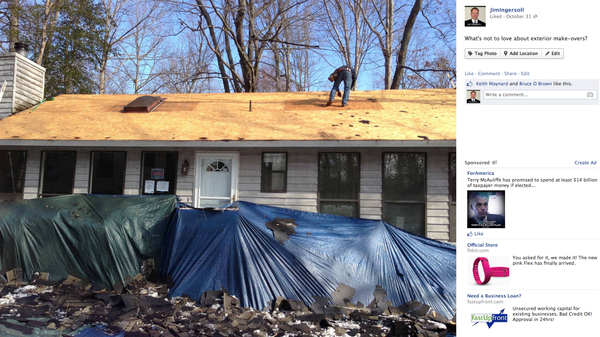 Post pictures of the houses you’re working on and tell your story to build credibility. Educate your connections on how they can invest passively with you in real estate investments and joint ventures by educating them on relevant articles about investing, self-directed IRA’s, and joint ventures. Not sure which articles to share? Start with this list, read through these articles and share them with your social media connections to start the conversation and develop private lenders. By the way, if you like these articles hit the Facebook, Twitter, and LinkedIn buttons to share them! I was building my LinkedIn.com profile about a month ago and sent an invitation to everyone in my yahoo account. The account was 15 years old, so I had quite a list. 🙂 I promptly forgot about it. About two weeks later an acquaintance from my past reached out to me and told me he was interested in real estate investing, and would I be interested in meeting when he is in town about being private money in a JV or two. UHHHHH YEAH!! Sometimes it is the simple things that make the biggest difference. Thanks for the simple suggestion Jim!! Next time you get a vacancy in a rental, ask your social media connections if they know anyone looking to rent. Post information on your rental and include a photo album of pictures, so they can see it. This also works great for finding tenant-buyers who want to do lease options. Incorporate Facebook into your tenant screening. It is a great way to get a look at potential tenants that goes beyond the rental application. 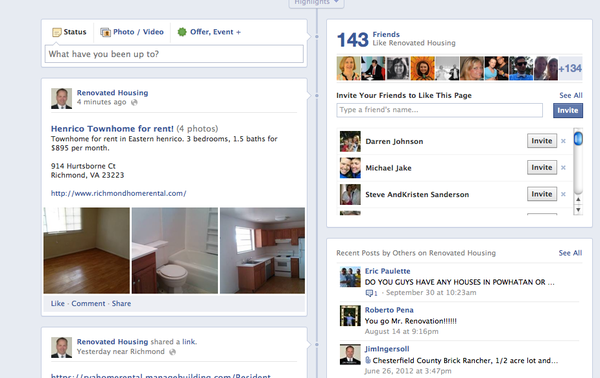 Do a Facebook search for potential tenants and get a glimpse into their everyday world. Be sure that you’re intentional about your social media by following the following three basic principles in your efforts. Be Visible– Don’t hide your real estate in a closet! 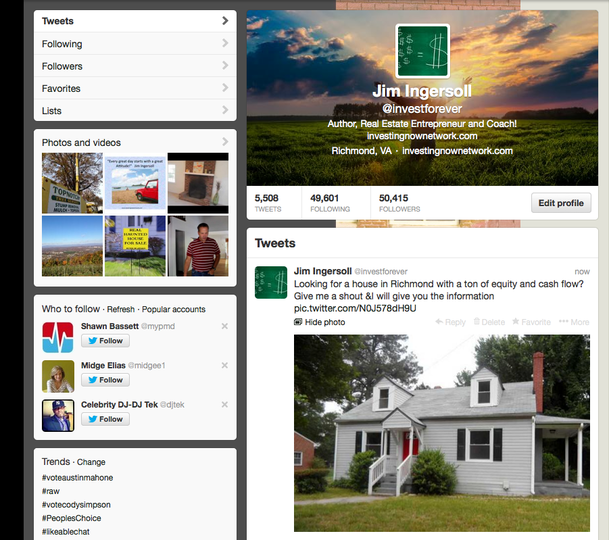 Update your profiles with your real estate investing credentials and goals. Be Consistent – Don’t post one time and never do it again. You need to become the go-to person in your area for helping folks find houses to buy (wholesale), grow retirement accounts with alternate investments, and your local real estate investing expert. Be Credible – How are you presenting and packaging yourself? Become a local leader in finding distressed housing opportunities and helping financial investors understand alternate investments like passive real estate investing and joint ventures. Attach yourself to credible articles, tell stories about your team, and the deals you are working on. What are your experiences with using social media for wholesaling, finding private lenders, property management, etc.? Leave me your comments below. This is a wonderful article. Thanks for the tips. Thanks! Happy connecting to you!